In 2004, I was in Haiti living under the injustice Bernard Gousse inflicted on his own people while serving the Haitian elite and the "International Community". Like many of Gousse's victims, I was driven into hiding - in my case it came after the arrest of the late Father Gerard Jean-Justice, a prominent Lavalas leader and human rights activist. Under the dictatorship of Gerard Latortue, Gousse ran the Ministry of Justice - an injustice machine that filled Haitian jails with political prisoners, usually targeting the most vulnerable. 1) Gousse became the Minister of Justice after the 2004 coup against Haiti's democratically elected President Jean-Bertrand Aristide. Gousse was considered as one of the most powerful men in the U.S-backed regime that ruled from 2004 to 2006. In the 1990s Gousse served in the military dictatorship of Raul Cedras; a regime that used the FRAPH death squads and brutal FAd'H forces to murder people in the slums and countryside. 2) Among the people illegally jailed by Gousse were Fanmi Lavalas officials under Aristide such as former Prime Minister Yvon Neptune, the former Minister of Interior Joselene Joceleme Privet and former legislator Amanus Maette. The allegations against all of them were shown to be completely baseless. In the case of Neptune, the illegality was so egregious that the Inter-American Court of Human Rights (IACHR) ordered the Haitian government to pay Yvon Neptune reparations. 3) With Gousse's enthusiastic support, the Haitian National Police, backed by UN troops, launched murderous raids on communities were support for Aristide was very strong such as Cite Soleil. 4) Since 2009, a Miami-based Haitian human rights group, Veye-Yo founded by the late Father Jean-Juste, has called for the arrest of Bernard Gousse. 6) The scale of the crimes committed by the Latortue dictatorship - in which Bernard Gousse played a major role - were revealed by a scientific study published by the Lancet Medical Journal in 2006. The study estimated 4000 political killings perpetrated by Latortue's securities forces and its armed allies. 7) There can be no true reconciliation without justice. 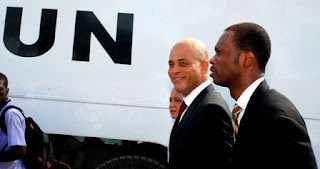 The choice of Bernard Gousse is a clear signal that the rights of the Haitian people will continue to violated under the Martelly administration. If Haiti's current President Michel Martelly is not a US puppet, he should arrest Gousse rather than appoint him as the head of his government. Anyone who has followed the situation in Haiti can see that Haitian people - in fact, anyone - deserves better than Bernard Gousse.